Seriously, if you hate our national anthem so much, then don't sing it or just leave the country! We should ban the tax dollars from the nation that anthem represents from being used at that school. You know, since they must consider those dollars offensive. 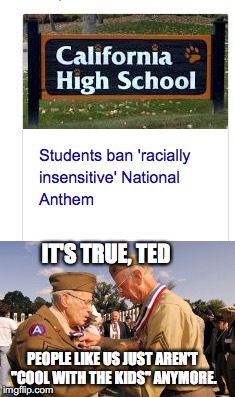 IT'S TRUE, TED; PEOPLE LIKE US JUST AREN'T "COOL WITH THE KIDS" ANYMORE.